Its always refreshing to hear Professor Alan Dershowitz; he speaks his mind, not worried by political correctness. As a liberal, but proud Zionist, he always puts Israeli leftists on edge, using terminology that makes them uncomfortable. Speaking to Army Radio, Dershowitz said the “Goldstone report is a defamation written by an evil, evil man." He said the jurist "allowed himself to be used to give a hechsher, a certification of purity, to defamation," and that Goldstone is a "man who uses his language and words against the Jewish people." Elaborating, the professor said that it would be as if the writers of the Protocols of the Elders of Zion "had asked a prominent Jew to read the report and sign it" to give it approval. Immediately after his comments was broadcast, former Meretz head Shulamit Aloni slammed Dershowitz’s remarks, saying he "certainly does not represent the entire Jewish community." If anything, Shulamit Aloni, "certainly does not represent the entire Jewish community," and she is the lunatic left wing fringe of Israeli society. She should simply just join up with another blogger, "Not My Tribe" who casts Sederot residents as "settlers" who are "occupied" Sderot combatants or simply human shields of the IDF. The sooner Israel's radical left admits they are simply "not part of the tribe" -- the clearer everything will be for all of us. If there is absolutely no common denominator with Shulamit Aloni and her followers -- then why not do us all a favor and go somewhere else. It must drive Aloni mad that her grandchildren are religious, chareidi Jews. The Rechavia Ramban Street Tunnel. 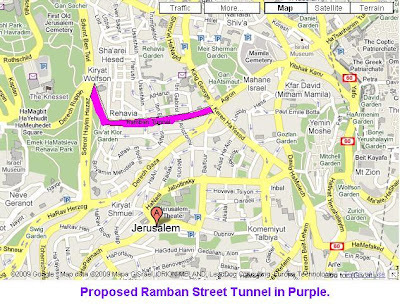 The idea is for the bulk of traffic which runs through Rechavia would be routed to an underground tunnel underneath Ramban Street from Gan Sacher to Gan Ha'Atzmaut -- thereby reducing noise and bringing back some peace and quiet to the neighborhood. The plan includes the tunnel, 2 giant underground parking areas; one by the Presidential Residence and one by the Rechavia Gymnasium High School, as well as recommendations for modifying the Rechavia building code to allow for greater than 4 story buildings in parts of the neighborhood. Opponents of the idea argue it will allow for the wholesale destruction of classic buildings. R' Shmuel Eliyahu, the Town Rabbi of Tzfat has announced a halakhic ruling, forbidding the eating of dried fruits, imported from Turkey. As Tu BiShvat approaches this coming Shabbat, many people traditionally eat from the 7 fruits of Eretz Yisrael, and Turkey is a key source of dried fruit in Israel. Twenty-six year old Michael Edri is a former resident of Netzer Hazani, one of the Jewish communities in Gaza that was evacuated in the Disengagement. He and his family have been struggling to rebuild and get settled ever since their community was destroyed. In effort to help his family ‘get back on their feet’, Edri has launched a new business called “Tuv HaAretz” (Goodness of the Land), which sells packages of dried fruits and nuts that are grown and packed in Israel. All of the products are organically-treated and bug-free. Edri’s business is still in its beginning stages, but Tu B’Shvat sales are putting him on the map. The only company that uses Israel-based produce, Tuv Ha’Aretz buys from Israeli farmers in Tzfat, the Galilee and the Negev. Edri also employs other Gush Katif evacuees to pack the fruits. “I thought it was ironic that most of our fruits and nuts—products that come directly from the earth—are imported from abroad. Tu B’Shvat is about our connection to the Land of Israel; we should benefit from Israel’s bounty,” says Edri. Edri, now married with a child, lives close to his family in the caravan community of Ein Tzurim. He was able to establish his business with significant guidance and assistance from JobKatif, the non-profit organization that offers employment services and support to the former residents of Gush Katif and Northern Samaria. JobKatif has been so successful in helping the evacuees that the Israeli government recently agreed to grant over $4.5 million to continue their work, contingent on the organization raising the equal funds. 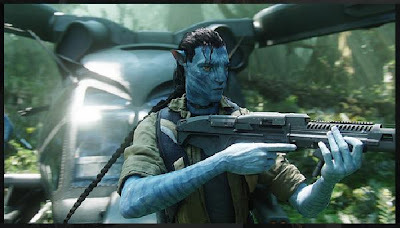 What does the blockbuster movie Avatar have to do with Israel and the Palestinians? "The Palestinians should learn from this film what to do to Jews! This film reflects exactly the situation of the Palestinians and the Jews"
Yup, Avatar is precisely, a perfect comparison between the Jews and Palestinians...the exact analogy. I guess you need 3d glasses to get the full effect...and some of the same stuff that Juliano Mer's been smoking. He probably helped fund the study we reported today, in which it is "scientifically" determined that Israel is to blame for Palestinian men beating their wives. Where does the "unobtanium" fit into this perfect analogy? Gee, I must be an ignoramus. I thought those men watching their imams spouting off about Quran 4:34 had more of an influence. No doubt the PA-financed, rabid Leftist study examined this issue and found it irrelevant. And here's a website that analyzes the verse and cites 6 different translations. (IsraelNN.com) Special Yassam units have destroyed a synagogue in the Shomron-Binyamin community that was built after the construction freeze was announced. 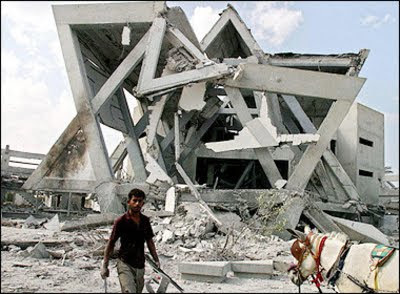 The Torah scrolls were first removed from the building, and the bulldozers began the destruction shortly afterwards. 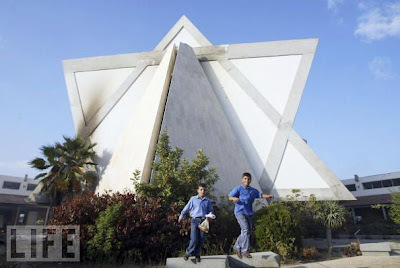 The destruction of a synagogue, especially in Israel, is considered very serious, in terms of both religious sensitivity and the efforts, in the words of the Knesset Law Committee, to "prevent harm to synagogues around the world." 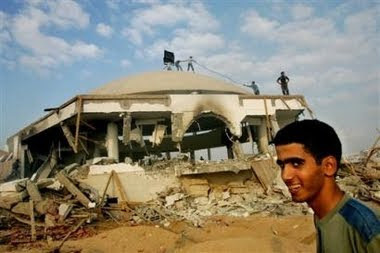 After the Disengagement/expulsion from Gush Katif in 2005, the government originally planned to destroy the synagogues that remained in Gaza, in order to avoid their desecration by local Arabs. However, even this fear was not considered sufficient reason to destroy those holy sites, and following opposition by rabbis around the country and much debate, the decision was rescinded. 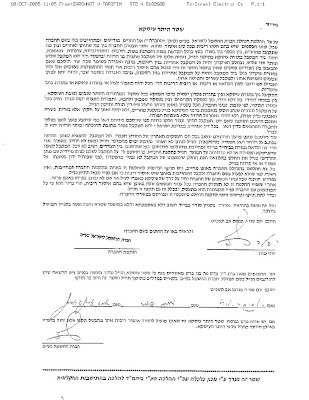 A friend of mine recently wanted to invest in the Israel Electric Company by purchasing IEC issued corporate bonds. Yet, as an observant Jew, he was concerned about transgressing the Torah laws of charging interest -- and wanted to know if the IEC indeed had a "heter iska" to allow for earning interest from the IEC issued bonds. "A Jew is prohibited from charging interest (ribit) to another Jew. 1. The Heter Iska was developed by the Rabbis in order to structure business transactions in such a manner as to avoid running afoul of the prohibitions against ribit (interest). 2. The Heter Iska principle is based upon the borrower and lender agreeing to be partners in a business venture, whereby one partner invests money and the other uses his entrepreneurial skills to manage the venture. The investor-partner can thereby earn "profit" attributable to his portion of the joint business venture, and the sharing of such profit by the manager-partner would not constitute payment of interest upon a loan. The arrangement thus has characteristics of both a loan and a trust. more here @ JLaw "
"Hello, I wanted to check if Chevrat Chashmal has a 'heter iska', to allow getting interest from the company’s agachim. If so, could you please scan it & send me a copy?" If you've been reading this blog for a while, you know that I've discussed at length, the possibility of US citizens resident in Israel (legally) receiving a tax credit of up to $1000 per child. Well, here's a news scoop: USA President Obama is proposing DOUBLING the Child Tax Credit to $2000 per child! The details are a bit murky, but the CBS affiliate, "Las Vegas Now" website posted the story. That's what President Obama says he intends to do. In his speech, he said he wants to offer tax credits to people struggling to care for their families. "We've just come through what was one of the most difficult decades the middle class ever faced," he said. The president plans to nearly double the child care tax credit for families earning less than $85,000. For example, the rate would go from 20 to 35-percent, so a family with two kids and an income of $80,000 would get a tax credit of $2,100 instead of $900. "During these tough economic times, I think it's going to help save money. Everyone is about saving, said Alexander Gonzalez. At the very least, many people are grateful the credit might keep them from owing money. But some parents say their hope is that this tax reform doesn't take as long as the healthcare overhaul. "He has promised a lot of things – well, not promised, but said he'll do a lot of things. So the proof is in the pudding," said Dan Land. The nearly doubled tax credit is for families earning less than $85,000. Families earning up to $115,000 could also see a smaller tax credit increase, but the White House hasn't said how much. I don't know if this will pan out, but its a story we'll be following here at the Muqata. Instead of saying people that US President Obama is a negative reason to make aliya...we see him here actively helping US Olim in Israel! The deputy prime minister of Greece has sent back to the Israeli Embassy in Athens three bottles of wine given to him as a gift, because they were produced in the Golan, which "belongs to Syria" and is "illegally occupied." The embassy had given the wine to Theodoros Pangalos - MP for the socialist party PASOK and responsible also for co-ordination of the foreign policy and defense committee in the Greek government - as a gift for the Christmas holidays with the wishes of Israel's ambassador to Greece, Ali Yihiye. In a letter sent to the embassy with the returned wine, Pangalos said he was taught not to steal and not to accept products of theft. "I have been taught since I was very young not to steal and not to accept products of theft," he wrote. "So I cannot possibly accept this gift and I must return it back to you. "As you know, your country occupies illegally the Golan Heights who belong to Syria, according to the international law and numerous decisions of the international community," Pangalos added. Referring to atrocities that occurred during the Second World War and the Balkan War, the socialist MP said: "Actions such as those of these days of the Israel military in Gaza remind the Greek people of holocausts such as in Kalavrita or Doxato or Distomo and certainly in the ghetto of Warsaw." While he called for an end to Hamas's terrorist activities, he compared Israel's action in Gaza to Nazi Germany's army. "I take the opportunity to express my hope that Israel will find security into its internationally recognized borders and the terrorist activities against Israel territory by Hamas or anybody else will be contained and made impossible, but I also hope that your government will cease practicing the policy of collective punishment, which was applied on a mass scale by Hitler and his armies." Sounds like a scoop, right? Lurker quickly came to the rescue, with the "Google cached" copy of the original JPost article. It's all there. So what happened? Why did it simply disappear without a trace? The exact same story appeared on the internet on Dec 31, 2008...two years a year ago, and while google translate from Greek to English isn't perfect, I managed to decipher very clearly, the word "fake." Thank you for the three bottles of wine sent to me as a Christmas gift. I wish you, your family and everyone at the embassy you a Happy New Year. Health and progress to all of you. Unfortunately I noticed that you sent the wine is produced in the Golan Heights. I have learned since I was too young not to steal and not to accept stolen goods. It is not possible to accept this gift and I have to return it. As you know, your country illegally occupies the Golan Heights, which belong to Syria under international law but also in numerous decisions of the international community. On this occasion I express my hope that Israel will find security within internationally recognized borders and the terrorist attacks on Israeli territory by Hamas or anyone else will be limited and will cease permanently, but I also hope that your government will stop practicing the policy of collective punishment has been applied on a massive scale of Hitler and the army. Acts such as Is that the days of the Israeli military in Gaza, remind us of holocausts such as those of Kalavrita of Doxato or Distomo and certainly that of the Warsaw ghetto. With these thoughts, let me express my best wishes to you, the Israeli people and all peoples of our region of the world. Now, since I haven't found any apology or clarification on the Jerusalem Post website -- I can't be 100% certain why they took this story down. I also don't know with 100% certainty that this is a spoof story that was going around. What I do know, is that this "news scoop" of the Jerusalem Post is at least 2 years over a year old, and the I did find references in Greek to this being a "fake" story. The site Jameel found, on which Mr. Pangalos' letter appeared last year, seems to be a Greek right-wing nationalist blog. Pangalos, meanwhile, is a leftist socialist, and the blog in question doesn't like him very much. I think that the meaning of the word "fake" that appears there is intended to refer to Pangalos himself, rather than to the story about the nasty letter that Pangalos wrote. I.e., the blogger is saying: Pangalos bragged in his letter that he is a straight and honest person, but actually he is a "fake" and a phony. In any case, the letter itself seems to be genuine. Pangalos does seem to have actually written and sent it -- but that was over a year ago. The Jerusalem Post, however, reported the story as though it were fresh, breaking news. (One is reminded of Yori Yanover's suggested slogan for the JTA: "Yesterday's News Tomorrow".) Once can assume that this is why they took it down, once they discovered their embarrassing mistake. Prominent PASOK deputy and former Foreign Minister Theodoros Pangalos chose Sabbath of Passover to launch an extempore protest march of bipartisan politicians on the Embassy of Israel. Finding the embassy closed, he claimed that "it isn't the Sabbath of Passover in Greece and they should respect the country they’re living in." In full page essay in To Vima (14-4-02), Greece’s largest selling Sunday paper, Pangalos accused Greek Jews of "glaring absence from all demonstrations against the massacre of the Palestinians" and of "silence, apathy or, even worse, solidarity with the Sharon Government." He demanded that Greek Jews unequivocally condemn the Sharon Government and "then, we…will be able to stand by them, without reservation, against all forms of prejudice and attempts at discrimination." A real piece of work, this one. He seems to be the Greek George Galloway. One can't help but wonder what the Israeli Embassy was thinking when they decided to send this rabid antisemite a gift. There's been a marked escalation of Palestinian rock throwing lately on the roads. The Jerusalem Post caught some attacks on video in Hevron -- as Palestinian kids throw rocks at their neighboring Jewish homes. And then, there are rock attacks on Jewish motorists. Last week, on one of the primary roads in the Shomron, there was a rock attack directed at an Israeli motorist. While the vehicle was traveling about 90 kilometers an hour (about 55 mph), a Palestinian threw a rock at the car, which smashed through the windshield, hitting the driver in the face. "Luckily" for the driver, the rock grazed the side of his face, cutting it open deeply, resulting in a moderate facial and head trauma. The emergency medics arrived quickly on the scene, and helped bandage up the driver and load him onto the arriving ambulance. The driver is lucky. An inch to the left and the rock would have hit him squarely in the face, which most likely would have killed him. After he was transported to the hospital's trauma room, I took a photo of his car. Over 2,500 years ago, Yechezkel preached to the Jews who had been exiled from Israel to Babylon. 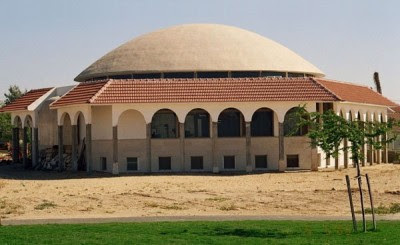 Some believe that al-Kifl is the site of the great Yeshiva Academy of Sura, where the Talmud Bavli (Babylonian Talmud) was that codified. The famous traveler Benjamin of Tudela visited Ezekiel’s tomb in the 1170, the earliest written account of its existence. His trip report states that the synagogue attached to the tomb contained a torah scroll written by Ezekiel himself along with books from the period of the first Temple in Jerusalem. 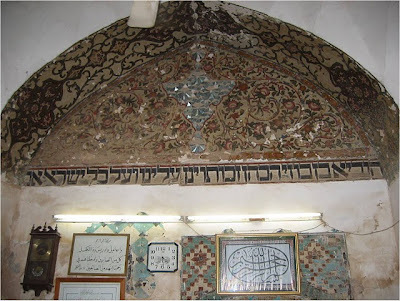 In the 1300s, Muslim officials turned the synagogue on the site into a mosque, which was ruined by flooding in 1778 (though the minaret still exists). Until the 1820s, Jews were banned from passing through the external courtyard to the tomb. In the 1840s, Jews reclaimed control of the site after appealing to Ottoman authorities. 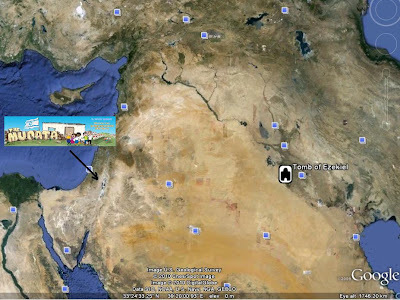 A yeshiva with scholars from Baghdad was established, and craftsmen from nearby Hilla and other cities settled there. Disputes over the site flared up again in 1860 and the 1930s, when the synagogue was taken over briefly by Muslims. To try to resolve tensions, Jews and Shi’a had different prayer times inside the shrine. The shrine is located off a covered market established by local Jews. In fact, many stalls owned by Jews who left in the early 1950s remain empty. Decayed Jewish homes and store rooms also remain along the back side of the shrine. The entrance from the market opens onto a courtyard of mud buildings with olive, palm, and fig trees growing in the center. The small rooms surrounding the courtyard were used a guest rooms by Jewish pilgrims, who would come in large during important holidays, including Passover, Sukkot, Shavuot, and the period between Rosh Hashanah and Yom Kippur. 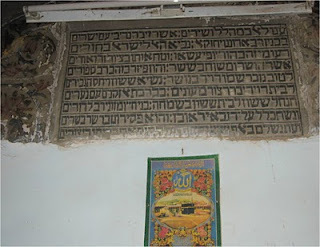 Adorning the room of the tomb, was the following Hebrew inscription. The most recent to visit the shrine said that some of the inscriptions are now hidden by a layer of plaster. The IDF Radio report says the the Iraqi government claims it was a "misunderstanding." The following 5 minutes video about an Iraqi's thoughts of the Jews of Bavel as the interviewer goes to al-Kifl is also enlightening. The Haitian Ambassador to the US was a guest at our shul this Shabbat. In the course of his speech to our congregation, he thanked Israel for its "disproportionate" response. IDF Rescues man in Haitia after 10 days under rubble! 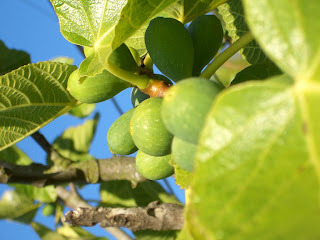 10 DAYS AFTER THE EARTHQUAKE! [The Israeli emergency delegation is] headed to Haiti on two missions: Rescuing survivors and establishing a field hospital. Yet the first mission is almost impossible, as the time that has elapsed greatly diminishes the chances of finding survivors under the rubble. American television is known for the phenomenon of "disaster correspondent" -- a journalist sent to any location worldwide that is hit by a disaster. Yet it appears that the State of Israel is following this conditioned reflex too: Whenever there's a disaster somewhere around the globe, we're there, with the IDF's Home Front Command and our teams. What exactly is the point of YNET -- to demotivate the country as much as possible? Could it be that President Obama isn't bold enough to simply point at the real reason there's no peace in the Middle East? "If the Arabs would put down their weapons today, there would be no more war. 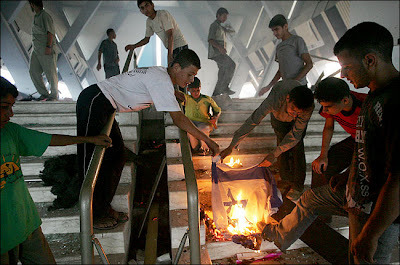 If Israel would put down their weapons today, there would be no more Israel." -- Golda Meir. If the Disengagement wasn't "bold enough", resulting in rockets around the clock hitting southern Israel, and then when we retaliated in self-defense we were Goldstoned and condemned by the entire planet...I think we don't need to be any bolder. Yom huledet sameach to the man who makes the finest waffles in the world. Hope it is/was great! Why are there Christian New Testament Bible Codes on IDF Rifle Scopes?! I was sure this was a weird urban legend, till my buddy DoubleTapper told me all about it and posted all the details on his blog. Apparently, the code JN8:12 which is encapsulated in the Trijicon Rifle Scope's serial number is an intentional mention of the book of John, chapter 8, verse 12. Now, that's NOT going to stop me from using these rifle scopes (since they are the best marksman scopes out there), but I would perhaps scrape off the numbers. What would be a good replacement pasuk from the Torah for an IDF rifle? (I wonder if the Nachal Chareidi Batallion will do anything about this). The Delegation to Haiti - Sent by an IDF soldier in Haiti to his parents. In the lifesaving IDF Medical Corps Delegation to Haiti which is housed in tents, doctors prevent disabilities. They administer aid to the sick, provide warmth, love, and a human touch. They love the wounded. In the IDF Medical Corps Delegation to Haiti which is housed in tents located in the middle of a hell, every complex medical case has an ethics review board. In the IDF Medical Corps Delegation to Haiti which is housed in tents, the chances of success are debated whether to amputate the entire leg of a child: the chances of a premature infant to survive while on a ventilator in a preemie unit in the tent. In the IDF Medical Corps Delegation to Haiti which is housed in tents, there were no rods left to brace complex fractures. Each rod costs 5000 Euros. Money is not the problem. There simply isn't any. An emergency room nurse had an idea. She went with with Munitions NCO to take similar rods to a local metal shop where they made dozens of new rods. They continue to save lives. In the IDF Medical Corps Delegation to Haiti which is housed in tents, there is a networked computer system for patient management and tracking. X-rays taken in the radiation tent are viewed on a digital viewing system in the orthopedic tent. In the IDF Medical Corps Delegation to Haiti which is housed in tents, the Russian delegation asked the Israeli "superpower" for medical equipment. In the IDF Medical Corps Delegation to Haiti which is housed in tents, there are religious ZAKA volunteers. They deal with the severed limbs and bodies of the dead and wounded from Haiti. They do this because of their respect for the dead and their respect for the Haitian Creole speaker, voodoo worshiper in the Caribbean Sea at the edge of the Atlantic. In the IDF Medical Corps Delegation to Haiti which is housed in tents, doctors ask permission to photograph the Haitian wounds, yet the Haitian patients do not understand why someone would ask such permission of them. In the IDF Medical Corps Delegation to Haiti which is housed in tents, there is a shortage of plaster for casts. An innovative doctor spoke to a Haitian hospital nurse for help, but the hospital could not help. He was sent to an remote neighborhood between the fetid alleys to the Moroccan embassy in Haiti. There, he found a storeroom full of plaster which was brought back to the hospital. The Israeli doctor, by the way, is of Moroccan origin. In the IDF Medical Corps Delegation to Haiti which is housed in tents, there is a delivery room. Babies are born there. Mothers are cared for. Babies that require aid are admitted to the preemie unit. In the IDF Medical Corps Delegation to Haiti which is housed in tents, the badly wounded patients have plastic surgery operations. In the IDF Medical Corps Delegation to Haiti which is housed in tents, the law of a patient's rights is observed. His right to privacy is respected. A patient's condition is explained to him in the Creole language via an interpreter. In the IDF Medical Corps Delegation to Haiti which is housed in tents, there are equal rights among all. Equal rights in Haiti, which was a nation of slaves, where even today there exists a great social divide between the rich and the poorest of the world's poor. The IDF Medical Corps Delegation to Haiti which is housed in tents is the embodiment of ultimate human ethics. Brotherhood at its best. The epitome of the verse from the Biblical portion of Kedoshim, "Love your neighbor as yourself." בנם של דניאלה וגארי ברובינסקי, נמצא עם המשלחת בהאיטי. כדאי לקרוא את המייל שלו. במשלחת חיל הרפואה בהאיטי, הממוקמת באוהלים מצילים חיים, מונעים נכות. מעניקים לחולים טיפול, חום ואהבה ומגע אנושי. אוהבים את החולים. במשלחת חיל הרפואה בהאיטי הנמצאת בלב גיהינום של מסכנות עושים ועדות אתיקה על כל מקרה רפואי מורכב. במשלחת חיל הרפואה בהאיטי מתלבטים מה סיכוייו הרפואיים של ילד קטוע רגליים עד למפשעה; מה סיכוייו של פג לשרוד מונשם בפגייה שבאוהל. במשלחת חיל הרפואה בהאיטי לא נשארו מוטות לקיבוע שברים מורכבים. כל מוט עולה 5,000 יורו. הכסף זה לא הבעיה. פשוט אין. אח חדר ניתוח פיתח רעיון, התחבר לנגד חימוש שלקח מוטות דומים למחרטה מקומית, וייצר עשרות מוטות חדשים לקיבוע. ממשיכים להציל חיים. במשלחת חיל הרפואה בהאיטי הממוקמת באוהלים קיימת מערכת רשת ממוחשבת לניהול ומעקב אחרי המאושפזים. צילומים הנעשים באוהל הרנטגן נראים במערכת דיגיטלית המוצבת במחלקת האורטופדיה. במשלחת חיל הרפואה שהגיעה מישראל שבמזרח התיכון להאיטי עובדים רופאים אמריקאים מתנדבים. כי אין להם מתקן יעיל אחר לעבוד בו. רופא ואחות מגרמניה הגיעו לכאן. כי שמעו שזה בית החולים הטוב בהאיטי. צוות חדר ניתוח קולומביאני הגיע על ציודו המלא וביקש לפרוס לידנו ולהיות חלק מבית החולים. 20 רופאים ואחיות בריטיים ביקשו לעבוד עימנו. בריטניה היא המדינה הנאורה ההיא שם באירופה. זו המחרימה אקדמית את ישראל. כל אלה, ללא יוצא מן הכלל, עומדים למסדר בוקר כל יום בשבע בבוקר ברחבת הדגל. דגל ישראל. דגל המדינה שהוקמה אחרי שארצות הברית הייתה למעצמה המובילה בעולם. אחרי שהבריטים עזבו את הארץ שהייתה תחת שליטתם. אחרי שקולומביה כבר הייתה מדינה ותיקה. אחרי שהגרמנים הוציאו לפועל את שואת העם היהודי. במשלחת חיל הרפואה בהאיטי הממוקמת באוהלים מבקשים אנשי המשלחת הרוסית מהמעצמה הישראלית סיוע בציוד רפואי. במשלחת חיל הרפואה להאיטי מתנדבים אנשי זק"א דתיים. מטפלים בגופות וחלקי איברים של נפטרים וקטועים מהאיטי. בגלל כבוד המת, כבודו של ההוא ההאיטני דובר הקריאולית, הסוגד לוודו שבים הקריבי שבקצה האטלנטי. במשלחת חיל הרפואה בהאיטי הממוקמת באוהלים מבקשים רשות מהחולים לצלם את אבריהם הפגועים, אבל לא מצליחים להסביר להם את מהות השאלה. במשלחת חיל הרפואה בהאיטי הממוקמת באוהלים נוצרה מצוקה בגבס. רופא בעל יוזמה פנה לנזירות בבית חולים ההאיטני בבקשת סיוע. לא היה להן. הם הפנו אותו לשכונה נידחת, אל בין סמטאות מצחינות שם ממוקמת שגרירות מרוקו בהאיטי. במחסן אצלם נמצא מלאי גבס שהובא לבית החולים. הרופא אגב היה ממוצא מרוקאי. במשלחת חיל הרפואה בהאיטי הממוקמת באוהלים יש חדר לידה. נולדים שם תינוקות. מטפלים ביולדות. מאשפזים יילודים הזקוקים לכך בפגייה. במשלחת חיל הרפואה בהאיטי הממוקמת באוהלים מבצעים בחולים הקשים ניתוחים פלסטיים. במשלחת חיל הרפואה בהאיטי הממוקמת באוהלים מקיימים את חוק זכויות חולה. שומרים על זכויות הפרט שלו. על סודיות רפואית. מסבירים לחולה את מצבו בשפה הקריאולית, דרך מתורגמן. במשלחת חיל הרפואה בהאיטי הממוקמת באוהלים מתקיים שוויון זכויות מלא בין כל בני האדם. בהאיטי, שהייתה מדינת עבדים, וגם כיום קיימים פערים חברתיים נוראיים בין קבוצת עילית עשירה לבין העניים שבעניי העולם. במשלחת חיל הרפואה להאיטי הממוקמת באוהלים מגולם המוסר האנושי בשיאו. מתקיימת אחוות האדם בתפארתה. בא לידי מוחשיות נדירה הפסוק מפרשת קדושים, "ואהבת לרעך כמוך." 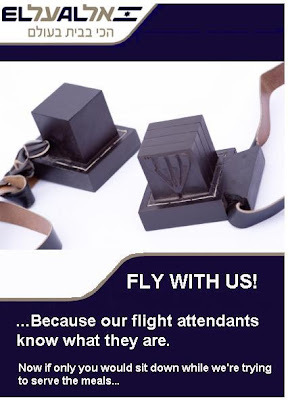 "A Jewish prayer box worn by a teen passenger caused a Thursday morning furor on a flight from LaGuardia Airport, forcing an emergency landing in Philadelphia, authorities said. Vanore said the unidentified youth was cooperative with authorities after the plane landed. (NY Daily News)"
hat-tip: one tiredema, YG, and many others! Regavim appeal to Bagatz: Tell the government to enforce its own demolition orders against illegal Arab buildings in Mizrat el-Kabilya. Government response: We have the right to decide our own priorities for when to do things. Bagatz decision: Sounds good to us. Peace Now appeal to Bagatz: Tell the government to enforce its own demolition orders against illegal Jewish buildings in Haresha and Hayovel. Bagatz decision: No, the law is the law: You must get started on destroying the Jewish buildings right now. Regavim appeal to Bagatz: So then tell the government to also get started on destroying the illegal Arab buildings in Mizrat el-Kabilya now. Government response: Our top priority is to forcibly prevent Jews from building; we don't care very much about illegal Arab building. Time Magazine is bold enough to rise above the political correctness epidemic which is infecting US policy and administration -- and criticizes the official US military report on the Ft. Hood massacre. The U.S. military's just-released report into the Fort Hood shootings spends 86 pages detailing various slipups by Army officers but not once mentions Major Nidal Hasan by name or even discusses whether the killings may have had anything to do with the suspect's view of his Muslim faith. And as Congress opens two days of hearings on Wednesday into the Pentagon probe of the Nov. 5 attack that left 13 dead, lawmakers want explanations for that omission. Its about time -- and this isn't rocket science. 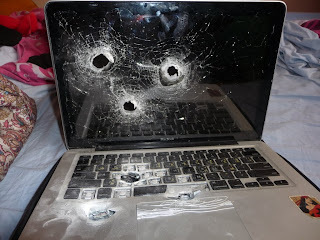 Remember all the flak Israel got for shooting up the laptop of a "peace activist?" Ever wonder why Israel's security might do such a thing? BERLIN — Part of Munich airport was closed for hours Wednesday as officials searched for a man whose laptop had triggered an alert for possible explosives at a security checkpoint, police said. Federal police said they ordered part of the airport's Terminal 2 closed to look for the man following the incident at 3:30 p.m.
An airport security instrument alerted officials to possible explosives as the man's laptop was being checked, police said. He then hastily left the scene carrying the computer into the terminal. The alert "doesn't necessary have to mean that there were explosives inside," federal police spokesman Albert Poerschke told the German news agency DAPD. Officials wanted to check the computer again, but the man left. "We believe that the man didn't realize there was more to come," Poerschke said.